I’m so glad you expanded on this pattern and made it for more sizes. I was a bit sad that my daughter wouldn’t fit into it for much longer, but now I can make her a toddler size to match the adult one I made for her daddy! Sophisticates for all! Haha, yes! Sophisticates for all! Very nice. 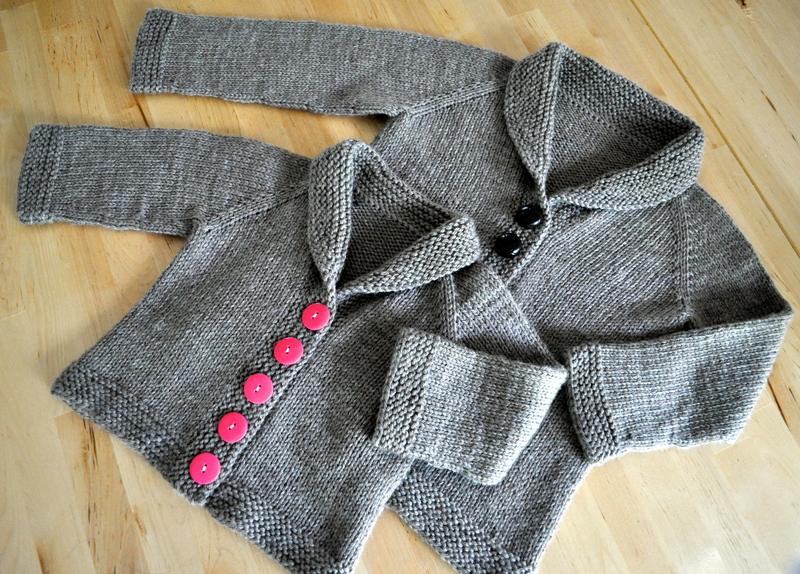 I like that you have it done with pink buttons and black buttons. I think I’ll buy this for my four year old son and make it for the fall. I purchased the child pattern from my local knit shop. Can I receive the updated revised version of the pattern. I’m picking up stitches and the count is off by 26, the pattern says the count is approximate but that much difference seems like an error. The pattern also says “1 st for each cast on st around left edge”, this is misleading as it has to be referring to the inc rows to shape the front. Right? This could change the way the collar lays, so I would welcome your input and the revised pattern. Please and thank you. Hi! Currently, there is not a new or updated version of the pattern. The count given is approximate because I wanted to leave room for people who have a different row gauge and may have knitted a few more rows (and would thus need to pick up more stitches). Where it says to pick up 1 st for each cast on stitch, that is only at the top of the sweater where you cast on and only for the cast on stitches. Where you work the inc rows, you should still be picking up 3 sts for every 4 rows. Hope this helps! Happy knitting! I need help! Absolutely love this pattern! I bought it to make the 24months version and I dont get the increases in Row 3 and 5. Especially confused by the wording of row 5, which in the end says k to last st, inc1, k1 do i knit to the last st? i dont have any st to knit… unless I am not reading well. Hi! Hopefully I can help. 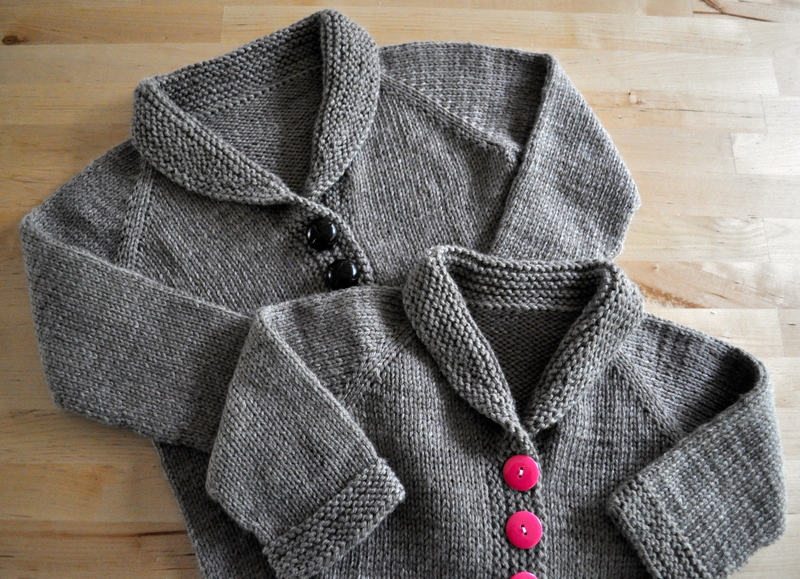 :) The difference between row 3 and row 5 is that on row 5 only, you are making an increase at the neck edge in order to create a slight v-neck to the cardigan. On row 3, after you work the four yoke increases, you will knit to the end of the row. But on row 5, you will knit until you have one stitch left, make an increase, and then knit one stitch. Your confusion on that row is probably because of the type of increase you are using. 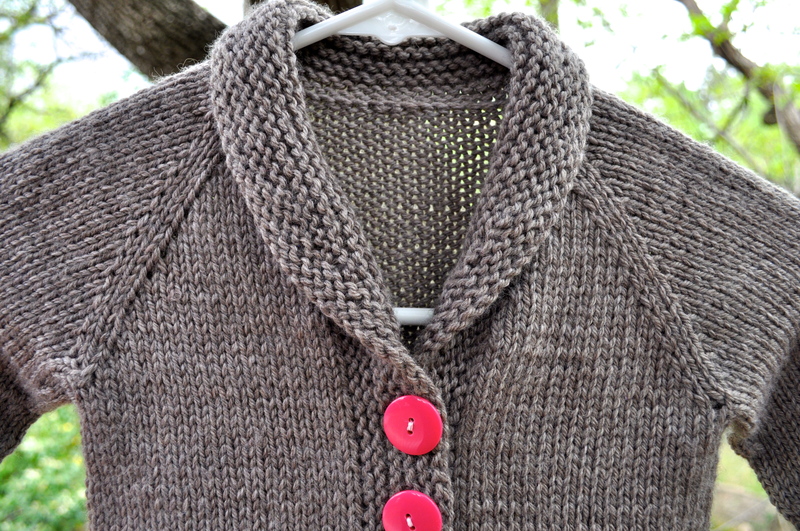 In the pattern, I use a backward loop increase, so that you don’t need to use another stitch. However, if you want to use a different increase that does use another stitch (like knit-in-front-and-back-of-loop), then you should knit until you have TWO stitches left in the row, make your increase, then knit one. I hope this is helpful! Thanks for your reply! I am using the same increase you use, I probably didnt understand the wording but will follow what you said here. Regarding the number of stitches I am supposed to have, do you have that partial count? I made my numbers and as mentioned looks like I wont get to the 130 I will need. Hi! So, for the 24 month size, you cast on 40 sts. Then, for each row 3 that you work, you add 8 stitches and for each row 5 that you work you add 10 stitches. Since you work rows 2-5 a total of 5 times, you will increase 8×5 sts (for working row 3 five times) + 10×5 sts (for working row 5 five times) = 40 sts + 50 sts + 40 cast on sts = 130 sts. Hope that helps! Thank you so much Linden! I got the right count! so excited about it =) I do love your patter and would like to make it many times. So far I am not loving how mine looks but it may be my choice of yarn… I am using Knit one crochet too Dungarease, Are you familiar with it? I made a swatch and it was pretty close to the gauge I need but still not sure. I may just get the one you suggest in the pattern. After you bind off the body… and you begin the sleeves where or how do you implement the working yarn..Such a cute pattern!! Hi! When you start the sleeves you will have to add new yarn and weave in the end when you are finished. I hope that answers your question! I may be having a brain spasm, but I can’t figure out how to pick up stitches starting at lower left edge. I have only ever picked up stitches going right to left. ?? Help! Thanks. PS I mean I normally pick up stitches right to left and with the work below where I’m picking up. These instructions make it sound like I should pick up with the work “above” the needle. Is this right? Feels really awkward. Thanks again. Hi! I think maybe the wording on the pattern is a little bit weird because you’re not the first person to ask me this! You should be picking up stitches in the way you describe. I mean the lower left edge as you are looking at the sweater (not as it is worn). I hope this makes sense! PPS I also had trouble with the pattern notes for wrap-and-turning. I think those instructions are perfect for working in stockinette, but I couldn’t make it look right in garter. If you take out the first yarn forward and just do slip-yarn forward-slip back-turn, it works easily. Thanks again — it really is adorable. Loving this pattern so far! Quick question though: in the stockinette section of the yoke, after the increase rows are finished, should I still be slipping the first stitch of each row? I have the same question…. do you continue to slip a stitch when working in stockinette until yoke measures 4.5″ and after the increases are done? Hi! Yes, you continue to slip a stitch all the way through the body of the sweater. Happy knitting! I just purchased this pattern, and I am about done with the yoke. I already have 5.5 inches, and I haven’t finished the increase rows to get to the 170 stitches for the 24 month size. I am getting the right gauge, so what do you think is the problem? Also, my pattern does not say to slip the first stitch of each row. Is there an update to this pattern? 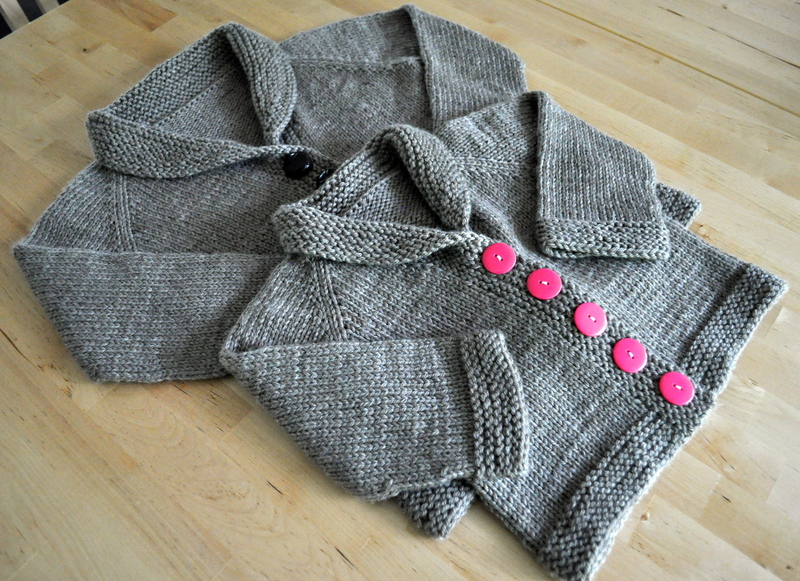 Love the pattern – have made it both baby and toddlers sizes. 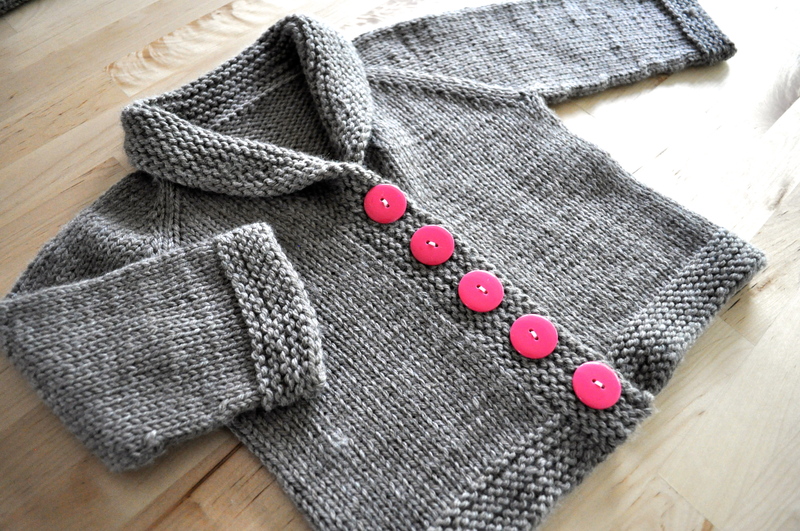 Do you have the pattern in adult size? 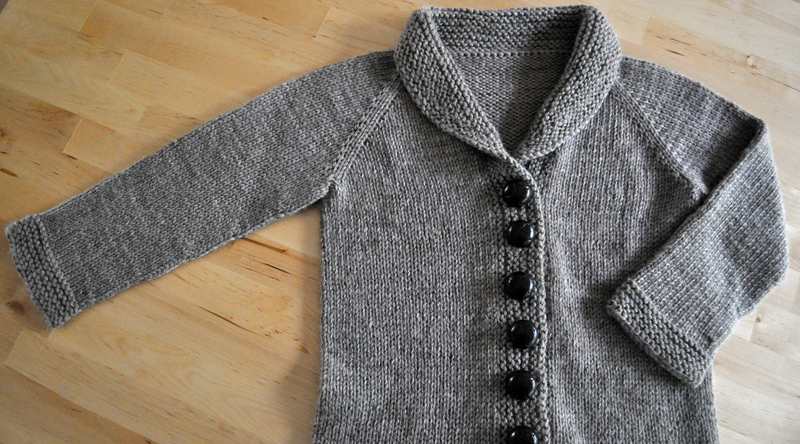 I downloaded the free baby version and finished knitting one sweater for 6-12 months size. I love it so much, I went ahead and purchased this (baby & child version. Looking over at this pattern, I have a question regarding the sleeves. Instruction says “Join new yarn and PU 6 sts from sts cast on at underarm. Place m in middle of picked up sts to mark beg of round.” The free version do not have the “PU 6 sts from sts cast…..” Can you please explain a little more on how to finish the sleeves. Thank you. I am having trouble understanding this as well. Any way to help me figure it out? Hi! Sorry that you’re having problems with the pattern! If you want to let me know where things are going wrong, I can try to help. For the buttonholes, they come in in the collar section after you work the short rows for the shawl collar, as a “YO, k2tog” combination. Hope this helps! After getting markers in place, do you knit to two stitches before the markers to start increasing or one stitch as stated. If one stitch, then that means the marker moves position each time. Is this right? Do we need to do a left and right backward loop to increase or does it not matter? What is a “garter stitch ridge”? Am I starting a garter stitch row? Or am I picking up a stitch from an already existing garter stitch row? And where is the “cast on edge”? Since this is knitted top down, is it at the top, along the neckline? I’m confused. Help!